Having read the novel twice, I knew the ending in the movie is happier in comparison. Despite whatever happened, the movie managed to squeeze out a happy ending. Actually, I had similar critique for the novel, except the novel described an unavoidable loss, a much stronger displacement or blank where the male Shiki (織) once existed. In addition, there is something about the current Shiki that Mikiya will never quite reach. There is much blood and violence in the movie, not to mention one strongly sexually charged scene. It is nothing like eroticism; rather, it is like watching a butterfly caught as prey as it is being overwhelmed and at the same time, strangely fascinated by its helplessness in facing a certain death. Indeed, much blood is spilt, much like in John Woo films where much shell casings and sparks fly and bodies tangle in the dance of death. As the blades cross, bite and scratch each other, one wonders for the similarities and differences between Shiki and the anti-Shiki, the latter seeking to find a companion in the world; anyone would do; anyone would do? Right? Being a self-proclaimed Otaku (most likely just another geek in a geek culture), I struggled much as the antagonist had. Throughout the movie, the anti-Shiki seeks solace; he seeks salvation of a sort by his effort of trying to find and to seduce Shiki and others to his side. It is his belief that Shiki can go back to the side that he believes he resides; it is his downfall that Shiki is no longer the same Shiki four years ago. However, as perhaps only the audience could observe and be sure of, Shiki was not the person the anti-Shiki wanted to be with four years ago, and after the events that followed, Shiki became something closer to a sense of believed normality. The novel hints at the acceptance of such as “the truth” but the movie forgoes the key conversation in the novel in favor of a gentler and more loving ending, perhaps to provide a crutch to people like me, who seeks normalcy in a world where its definition is becoming more and more blurred. But the fact remain is that I am still broken. The novel seems to confirm that, as Shiki muses the lost of the male part of self and the conversation that affirms that musing. The movie doesn’t ignore it, but it is certainly portrayed in a more positive light. 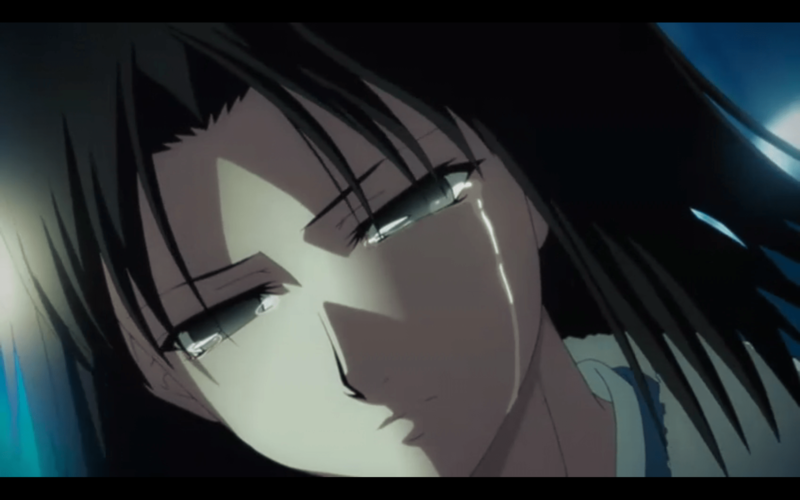 The male Shiki is the killer urge, thus as he is gone, it is better for Shiki, Mikiya and the world. But the loss is there. Both the novel and the movie come to terms with that fact, but somehow, I am slightly dissatisfied with the movie and the extension, the series. However, with the wonderful animation, superior voice acting, camera direction and music, the movies are masterpieces in emotional intensity and psychological quests of self-discovery in their own right. Other reviews on the series Kara no Kyoukai 1 Review, Kara no Kyoukai 2 Review, Kara no Kyoukai 3 Review, Kara no Kyoukai 6 Review. Previous PostChrono Trigger, Nostalgia, and the Beginning of FandomNext PostPetition for Claymore Season 2! I can’t leave this uncommented-on! TBH, my own opinion is still a blurry jumble that I can’t straighten out just yet but that back-of-your-mind doubt hit me too. Unresolved plot threads? Yeah, partly. I did still pick up on that sense of loss though, as much as the movie played it down – the physical injuries are lasting reminders that both Shiki and Mikya made sacrifices to get where they were in the end. It wasn’t excessively happy, but it was a warm fuzzy type of conclusion that’s more in the cinematic tradition than is normal for the Nasuverse (in which endings are often a bit more bittersweet and conflicting than this). I’ll try to say more about this at some point, but quite frankly it’s left me pretty much speechless. I don’t use the term ‘awesome’ lightly for a film like this, but that’s what it is. @ Martin – The movie left some things unsaid. I suspect for most, that is enough. I personally think, without reading the novel, the 7th movie is probably the best of them all. But then again, I wonder how is it that Mikiya can be overdosed and yet leave the compound alive. There is something about him that neither the novel nor the movie even explained. I recommend a second watch to get most of the things straight. No, I was not reading the English translation. I was readin the Chinese one. Okay, I’m just going to let it out. I’m very disappointed with this show. Maybe I’m just not the typical anime fan, but I HATE it when it’s the typical cliche where the tsundere girl who’s originally a total badass falls for a touchy feely guy who wants to save the world, and as a result loses their edge and becomes a total weakling. Also, what is it with Japanese people and split personalities?!? Just how many anime do you know where one of the main characters suffers from a serious identity disorder. Even it they added a little variation in this show, it’s still basically the same. One thing I did like was the gorgeous visual effects and the art, but that aside there were way too many dead spaces in between where nothing happened for 30 minutes or more. I mean, I appreciate some stillness to calm things down after some major action, but seriously, nothing happened for the majority of the show! By the way, I do not enjoy watching Shiki opening the fridge (which is filled with nothing but water?!?) and sipping the bottle 10 times in a row. Way too many WTF moments, which were really unnecessary. Still in shock after witnessing “anti-Shiki” chomping away at the corpse. A little over-the-top with how people died; humans do not spew blood like a fountain after getting decapitated or whatever, nor do they twist up like twizlers. I wanted to see more of Shiki’s character and her interaction with other people/situations which I think the 2nd movie did a good job of. Anyways, I’m just disappointed ’cause I didn’t think this would be so cliche. Some parts aren’t, but the majority is. Hope I haven’t seriously offended anyone. I’d have to agree with you on many points. That said, have you seen John Woo movies? Sometimes the blood dance isn’t going to be portrayed in a normal way. It is a stereotype in Japanese movies from the old that blood gushes like a foundtain. We all know in real life that’s not true. As for split personalities, it can be a bad plot device if over used. I suspect you’ve seen too much of it in Japanese anime. Yes, that can be really tiresome. In this case however, I think there is a reason for it. Reading the novel may help to clear it up better. The movies are almost digests when it comes to the larger world behind everything. In classic Japanese drama such as Noh, silence and stills are part of the overall setting to demonstrated the stillness in the cosmos. That said, you’re absolutely right that there are too many scenes stressing the emptiness of Shiki. We get it; we get it that she feels like she not here, we do! Thus, I do agree there. I didn’t realize that because I’m used to anime with that kind of imagry. Good fresh perspective. At the end of day, for those of use who have seen everything, the entire movie series can be seen as cliched. After all, all of us has been through so much that the scenerios in the movie can seen contrived and weak. However, one must remember that the artistic points in an anime is usually much weaker than a full-on indie/art film. After all, Anime is not a strong artisic medium. Oh, don’t be afraid of offending anyone. That’s what a good critic must do – offer fresh perspectives and challenge views. Thank you so much for offering a fresh view. An anime old-fart like me would never even bother to question many of the things that you questioned. I get so used to many of these things. I disagree from PocketMouse, since I believe that cliches always exist and for us to believe that a show is free of them is silly, to say the least. That being said, I value the effort to show common themes in different ways, and I think that’s where KnK excels. People nowadays love to label characters as “tsundere, kuudere, etc”, but I see more in Shiki than just a baddass girl that in the end has dere moments. I tend to see more of a lost person, like many people that exist nowadays, not just a ctrl c ctrl v character. I don’t know, I loved the movie very much so people may not take my opinion seriously, but I think the development far excels the real cliche ones. As someone who’s only seen the anime, I will not lie in saying that I think that the 5th movie is the best without a doubt. I will not lie though, I’m mildly annoyed at a number of things regarding the 7th film because I found that there were some story-telling issues in terms of the reasoning behind the characters’ dilemmas and the way the plot was carried out because of that. While it didn’t really kill the series for me, it just really stood out for me (especially from a story-telling perspective) considering how great the 5th film was. It’s not so much to do with preference, it’s just that there were some faults that really stood out for me even from an unbiased and objective point of view. When you notice actual flaws in the actual plot and the characters’ established development and their morals, I tend to get irritated. Those sorts of things tend to lose the effectiveness of what it’s trying to establish. While Kokutou surviving I could get past that for the sake of that particular ending, I absolutely didn’t like the reasoning for Shiki to hold back against Lio considering it was almost treated in a trivial matter on Kokutou’s part putting them both in worse situations than how things should’ve been. In the end the fact that all signs pointed to the same direction, just gave the impression that Mikiya suddenly selfishly contradicted himself in comparison to his portrayal in the past films despite having developed his own perfectly understandable reasoning for Shiki’s killings. This type of Fridge Logic and misunderstanding between Shiki and Kokutou was pretty much just set up to move the plot as opposed to actually delving deeper into Shiki’s killing instincts. It’s even made worse by the fact that Shiki’s intentions and motive for wanting to take down Lio was completely the opposite of what Kokutou was thinking, to the point that even Touko felt the same way towards Lio. Now all of that I could’ve forgiven, if not for the fact that there was no explicit scene that showed Kokutou having a large amount of self-doubt in his actions for stopping Shiki which gave could almost come across with the impression of ignorant selfishness. While I know that the scene after the fight was played out to keep in tune with their personalities and their interactions, I found that it looked worse on Kokutou’s part considering he pretty much quoted himself from the 3rd movie just to justify the killing of Lio, which could’ve saved them from so much trouble had he had done his research on him much earlier. From a story-telling perspective, it felt like Kokutou’s misunderstanding was just there to create an unnecessary conflict. This kind of thing tends to come across more as a randomly unneeded obstacle as opposed to actually creating a proper clash of emotions between Kokutou and Shiki. I was just annoyed by this because of how great the other movies were in crafting the reasoning behind the weight of their choices and what the stakes were, where as in the 7th film, the weight of Shiki’s reluctance is rendered almost non-existent by Kokutou’s reasoning and Shiki’s actual motives (in other words, it in turn made the whole thing unnecessary from a logical perspective, which shouldn’t be how the audience would feel). Actually one other alternative I would like to present that could’ve avoided all of the issues that I mentioned is if the ending segment in the 3rd movie in which Kokutou goes goes on to tell Shiki that he was willing to carry all of her sins was instead reserved for the 7th. That way, Kokutou’s reasoning for stopping Shiki from going after Lio wouldn’t have sounded as contradictory and it would’ve served as a clean cut resolution. I guess my main issue was that the whole reason was counter-productive to the point that Kokutou’s self-quoting himself from the 3rd movie’s resolve felt forced, where I would’ve preferred if that resolve was actually reserved for the 7th (especially since the 3rd film managed to dodge the moral dilemma of killing, that resolve was good but not necessary).